Here is some useful information you should read before coming along to shoot with Tamar Rangers Rifle Club. Unfortunately you cannot just turn up. You must contact the club ahead of time, either via email or by informing a member of the committee (allow 4-5 working days), as this gives us time to carry out the required process. If you are an existing FAC holder or member of another club, you will still need to check to ensure we have sufficient people on hand to look after you as a guest. 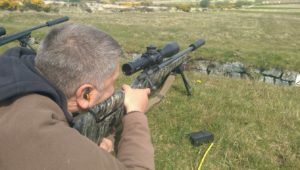 On some dates during the year, we cannot cater for new shooters so please check with us. Note: If you are prohibited under Section 21 of the 1968 Firearms Act from handling firearms, you cannot come along to a range day. Both ranges used by Tamar Rangers are ‘outside’ with little or no cover so good clothes and footwear are essential. Plan as if you are going for a walk on the moors as we have been known to have every type of weather in one day! You will need to bring ear protection and eye protection is also recommended and a sense of humour is mandatory! A full explanation of safety and how the day proceeds will be explained upon arrival and you will be in the care and supervision of a qualified club instructor or an experienced member throughout the day. Tamar Rangers operates a structured training program based around safety, competence and confidence. Should you wish to become a member, this process would be explained to you. There are a selection of club rifles and ammunition available for you to use. If you wish to borrow a rifle, please let us know in advance. Note: You can purchase ammunition to use during the day, but you cannot take it away with you. Finally, owing to the remote nature of the ranges you will need to bring your own packed lunches, snacks, coffee and drinks etc.